A compelling look at two leaders who held the world’s fate in their hands– and the holiday visit that sealed a friendship and steered the course of World War II. At the height of World War II, President Franklin Delano Roosevelt and Prime Minister Winston Churchill held an extraordinary month-long visit, during which they planned the success of the Allied powers and strategized a continuing peace for when the war ended. Moving from witty banter to gravely serious discussions– amid a traditional public celebration of the Christmas holiday– the two cemented a unique bond as they decided how to confront a menace that threatened all of civilization. 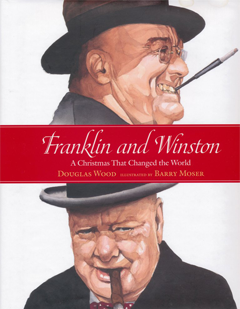 Now, on the seventieth anniversary of this event, thanks to the skillful work of author Douglas Wood and illustrator Barry Moser, the story of this remarkable time can be shared with a whole new generation.